Disney releases new FROZEN movie poster! Check out the new Frozen movie poster for the upcoming animated film starring the voices of Kristen Bell, Idina Menzel, Jonathan Groff, Josh Gad, Santino Fontana, Alan Tudyk, and Ciarán Hinds. The fearless optimist Anna (Kristen Bell) teams up with rugged mountain man Kristoff (Jonathan Groff) and his loyal reindeer Sven in an epic journey, encountering Everest-like conditions, mystical trolls and a hilarious snowman named Olaf (Josh Gad) in a race to find Anna’s sister Elsa (Idina Menzel), whose icy powers have trapped the kingdom of Arendelle in eternal winter. 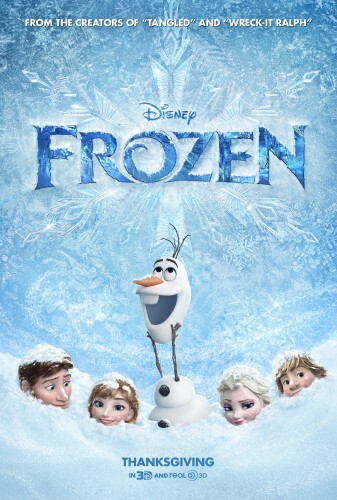 The Walt Disney Animation Studios film opens in theaters nationwide on November 27, 2013.